Here it is, the last day of March! Where does the time go? Before showing April in the door, let's celebrate March one more time! March is also "National Umbrella Month." Quick, what character is closely associated with an umbrella? If you said, Mary Poppins, you're correct! (The only prize I'll offer you is your own satisfaction at knowing you're a smarty-pants!) Mary Poppins by P.L. Travers comes in book [J TRA], audio [J AB TRA], film [J VIDEO MAR], and the soundtrack on CD [CD SOUNDTRACK MAR]. This month is also "Play-the-Recorder Month." How many of you remember playing the recorder in elementary school? Wasn't it fun? How about trying it again? We have Easy Recorder Tunes by Phillip Hawthorn [J 788.36 HAW], or The Usborne First Book of the Recorder by Caroline Hooper [J 788.364 HOO]. Today, March 31, has its own special day--it's "Bunsen Burner Day!" Yes, indeedy, a day for anyone who ever took high school chemistry to celebrate making it through chem lab and living to tell about it! And, what better way to make merry on "Bunsen Burner Day," then by borrowing The Muppet Show [J DVD MUP] and watching Beaker and Dr. Bunsen Honeydew! I hope all you "Fools" are ready for tomorrow! See you next month. As Women's History Month ends, I'd like to direct you to this article that appears on the Union Leader's site. The New Hampshire Commission on the Status of Women is planning to develop a NH Women's Heritage Trail celebrating 75 NH women who were either born, or lived, in the state and who left a mark on the state or the country. If you want to nominate a woman, the guidelines are found here. We recently received, and are now processing, More Than Petticoats: Remarkable New Hampshire Women by Gail Underwood Parker. This book profiles 13 NH women including the famous, Mary Baker Eddy and Laura Bridgman, and the not-so-famous, Hilda Brungot. Hilda Who? You'll have to borrow the book to find out! I'd also like to put a plug in for Women of Granite: 25 New Hampshire Women You Should Know by Janet Buell and The Write Sisters [J 920 BUE]. I'm a member of The Write Sisters and I greatly enjoyed researching and writing about the women I profiled--Oney Judge, Betsey Chamberlain, Elizabeth Gurley Flynn, and Windham's own Mary Bradish Titcomb. Mary Bradish Titcomb was born in Windham in 1858. By the time she was 17 she was teaching in the Windham schools. After her mother died, Mary, at the advanced age of 27, left Windham for Boston. There she embarked on a career in art as a student, a teacher, and later a full-time artist. 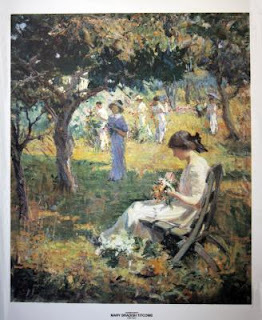 This one of Titcomb's paintings, "Garden Party," that appears to be widely available in poster format. She studied under the noted American impressionist, Edmund C. Tarbell and later belonged to a group of women artists known as "The Group." In 1915 one of her paintings was purchased by president Woodrow Wilson. Titcomb died in Marblehead, MA, in 1927, and her remains were buried here in Windham. We have a brief bio and information on her artwork in Mary Bradish Titcomb and Her Contemporaries: The Artists of the Fenway Studios, 1905-1939, a Vose Galleries catalog of an exhibition held in 1998. You may have picked up on the fact that I'm a fan of haiku. There is nothing briefer, yet so evocative! Still, I'm also drawn to the brief poem. I was browsing our poetry section where I found this Pulitzer Prize winning book of poetry, Moy Sand and Gravel: Poems, by Paul Muldoon [821 MUL]. That's it. Seventeen words implying so much. I read it several times and will probably read it several times more--you can do that with a brief poem. I hope it speaks to you, too! Have a great poetry day! This week's Poetry Friday Round-Up is being held at The Drift Record/Julie Larios. The escape from Stalag Luft III is a fascinating story, and is detailed in a report from 2004's 60th anniversary on the BBC site here. Stories of other WW II prisoners and prison camps are found in The Last Escape: The Untold Story of Allied Prisoners of War in Europe 1944-45 by John Nichol and Tony Rennell [940.54 NIC]. This Sunday, HBO is premiering a new series based on The No. 1 Ladies' Detective Agency by Alexander McCall Smith [F MCC, also AB/CD MCC]. The main character is a self-made detective from Botswana with the unlikely name of Precious Ramotswe. A gentle soul rather than a hard-boiled detective, she "specializes in missing husbands, wayward daughters, con men and imposters," but she does occasionally have brushes with danger. 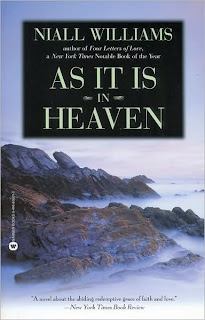 The book was a great success when it was first released in in 1998. McCall Smith has gone on to publish further adventures of Precious, the latest being The Miracle at Speedy Motors [F MCC, also AB/CD MCC]. The tenth book in the series, Tea Time for the Traditionally Built, will be released later next month. I heard a review of the televised version, and although the reviewer had mixed feelings, I think the series will be a hit due to its strong character and exotic locations. You may want to read the series if you haven't already come across it. Start now to avoid the renewed interest that will surely result when the television program is aired on Sunday. With a touch-button electronic module housing common vocalizations of 75 species from across Eastern and Central North America, this volume offers a truly sensory way to identify and get to know local birds. Crisply detailed and scientifically accurate illustrations accompany each entry, and up-to-date range maps from the Cornell Lab of Ornithology provide clear geographical reference points. 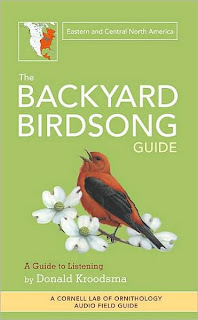 Complete with an introduction to birdsong that will inspire readers to look out their kitchen windows and venture out in the field, this unique book provides an exciting entryway into the subtle art of birding. I also want to mention an online article from the U.K. that alerts the reading to the possibility of losing songbirds in the near future. It's "The Sound of Silence: The Cuckoo is Vanishing," and it features audios of a number of birds. If you've only ever heard a cuckoo's song through a cuckoo clock, make sure you check out the real thing! I got a press release from the Library of Congress that tells of a recent acquisition of a collection Abstract Expressionism prints. I had to stop for a minute and think about what exactly Abstract Expressionism is. I realized I hadn't a clue! So, I looked up the definition online and then I went to see what we had in our collection. In our reference section, we have The American Century: Art and Culture 1950-2000 by Lisa Phillips [R 709 PHI], which discusses Abstract Expressionism and puts it into historical and cultural context. It is beautifully illustrated with photos and color plates. Sidebars throughout the book, written by subject experts, explain movements in the other arts, for example, there is one called, "The Sounds of Silence: Serious Music Survives." In our circulating collection we have Art of the 20th Century, volumes 1 and 2 [709 ART]. 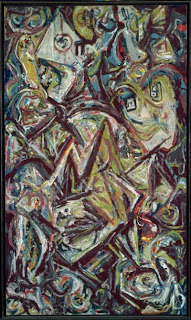 This large format work has a section titled, "The Paris-New York Shift," which covers Abstract Expressionism. Plan a trip to the Museum of Fine Arts in Boston, to view the work of Abstract Expressionists up close. The MFA site has a fine search engine where you can plug in the name of an artist to find what they have in their collection of more than 300,000 of works of art. Look for these Abstract Expressionist artists: Franz Kline, Willem de Kooning, Lee Krasner, Robert Motherwell, Jackson Pollock, Mark Rothko, Adja Yunkes. The search enables you to see if an item is currently on display. Remember, the library has a museum pass for the MFA, which is generously provided for us by F.L.O.W. 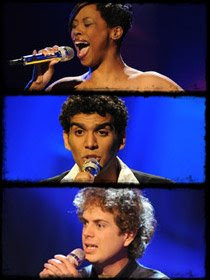 (our Friends group). Since today is the vernal equinox, or, the first day of spring, I thought I'd celebrate by looking at a book by Mary Oliver called Blue Iris: Poems and Essays [811.54 OLI]. The essays are nothing to be afraid of--they're not boring, weighty pieces on the mechanics of poetry--in most cases, I'd call them prose poems rather than essays. The poems are short and highly accessible, and, both poems and essays deal with nature, mainly flowers and plants. One poem, "Spring," pays tribute to the violet, the hardy herald of spring. 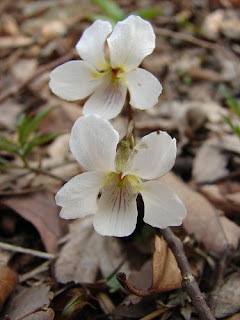 I have violets growing, weed-like, all over my lawn, but I love them! In another week or so, several will pop out propped up against sun-warmed bricks and stones waiting for the rest to arrive with the warmer temperatures of early May. I'd like to share a small piece of "Spring"--enjoy! I was dismayed to hear of actress Natasha Richardson's passing. There is only one movie I vividly remember her appearing in (although she appeared in many). The reason it was memorable for me is because Richardson played a young woman dying of cancer. The character's acceptance of her fate was moving. And now, with her death, I can only hope that she died with peace in her heart. 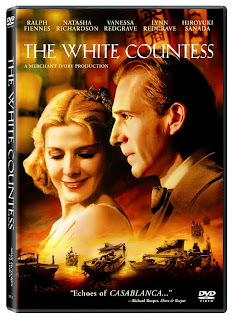 The White Countess (in this film Natasha is joined by her mother, Vanessa Redgrave, and her aunt, Lynn Redgrave). Sincerest condolences to Richardson's husband, Liam Neeson (Love, Actually [DVD LOV]), and her family. Once again, it seems a seat belt law is coming up at the NH State House. The New York Times has an article about it today that may be of interest, and, click here for the video that accompanies it. 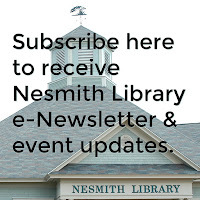 There seems to be quite a bit of erroneous use of terms and labels going on, and, if you're a reader of the Pelham-Windham News and its "Thumbs Down? Thumbs Up?" section you'll see labels like leftist, marxist, fascist thrown around with great frequency. 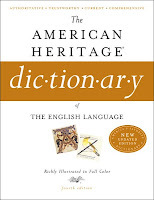 I don't know about you, but I'd like to see a few people borrow this book from our collection: The American Heritage Dictionary of the English Language [423 AME]. Or, for a more detailed explanation of terms, Today's Isms: Socialism, Capitalism, Fascism, Communism, Libertarianism by Alan Ebenstein [320.5 EBE]. Looking for something a little bit different to read? One of these titles will make you feel as if you were in Ireland cavorting with the leprechauns! Hannie Bennet, a battle-scarred divorcée and widow embarks upon her fifth marriage with a clear objective: to put a roof over her head and food in her stomach. But Hannie's marriage to aging Ned is doomed from the start. In the unnervingly tranquil Irish countryside where the couple settles, a secret past and an unwelcome visitor not only threaten their chance at a life of uneventful coexistence but menace the entire community. Marty Hawkins, brilliant student at Trinity College Dublin, is the pride of the parish of Fansha, his home in Tipperary, Ireland. But when tragedy strikes his family, Marty, overwhelmed by grief, abandons his academic career, forsakes his friends, and goes back to the green hills of Fansha. Moping about the family farm and a burden on his brother Pierce, who has acquired the interesting and alluring Etti for a wife, Marty seems destined for a quiet and solitary decline into failure. 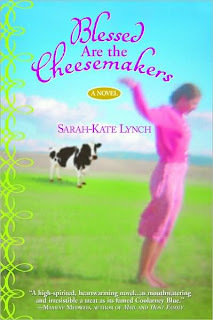 Set mainly in Ireland on a dairy farm, Blessed Are the Cheesemakers tells the story of two old men, Joseph "Corrie" Corrigan and Joseph "Fee" Feehan who are the best cheesemakers in the world, and the broken hearted women and whisky-soaked men they rescue in the course of their daily doing. On a rugged patch of Irish coast we meet Agatha and her daughter, Clodagh, who is determined to secure both her mother's love and the truth about her. Swept up into a relationship with a handsome, isolated man, Clodagh will confront two questions: "Does a truth change love?" and "What madness will come from chasing a secret?" Here are the Ruttledges, who have forsaken the glitter of London to raise sheep and cattle, gentle Jamesie Murphy, whose appetite for gossip both charms and intimidates his neighbors, handsome John Quinn, perennially on the look-out for a new wife, and the town’s richest man, a gruff, self-made magnate known as "the Shah." "In the south of Ireland, just beyond the town of New Rowan, young Michael McDonagh is growing up fast. The same families have lived in his village for generations, harboring old loyalties and even older hatreds, and a person's name casts a long shadow. Sometimes it seems that strangers know more about Michael than he knows about himself." Newly unemployed, Sophie White has nothing better to do when her recently widowed best friend, Gina, invites her along on a much-needed, postcrisis getaway. When, after only one day in Ireland, Gina decides she should do her grieving back at home, she urges Sophie to remain and make the most of the summer in Booley, the tiny seaside village that was their destination. Set in a general medical practice in the eccentric Ulster village in 1964. Dr. Fingal Flahertie O'Reilly is a fifty-six-year-old, unmarried country doctor, He is joined by the wet-behind-the-ears, medical graduate, who is unsure of where his future lies. From their initial encounter, when O'Reilly hurls a hapless carpenter by trade, into a bed of rose bushes, to the final chapter wherein Laverty solves his dilemma about whether to join O'Reilly in a permanent position. After the death of his mother, Stephen Griffin has remained isolated with his father in County Clare, Ireland. Just after his father learns that he is dying of cancer, a chance encounter leads Stephen to see a beautiful woman who he follows to Venice in hopes of winning her love. Like what it used to was! We sometimes get so hung up on our imagined recollections of the past, that we ignore the truth about the situations we lived through--like the weather, or Aunt Gert, who, if you thought about the way she tickled kids until they were in tears, you would have had to admit, she wasn't a nice old lady afterall! 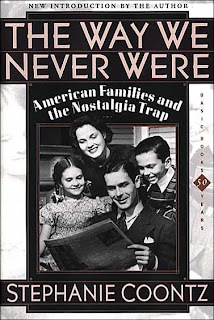 My hope was that by exposing many "memories" of traditional family life as myths, I could help point the discussion of family change and family policy in a more constructive direction. I wanted to show that families have always been in flux, and often in crisis. Knowing that there was no golden age of family life, I believed, would enable people to deal more effectively with the problems facing today's families than if they continued to romanticize the "good old days." Television, since the 1950s (think Leave It to Beaver), has had a great influence on the way we look at reality. For a fun look back, pick up As Seen on TV: The Visual Culture of Everyday Life in the 1950s by Karal Ann Marling [973.92 MAR]. Today, even so-called "reality" shows are actually far from real, but that's a subject for another time. Cathy--"I Chop Some Parsley While Listening To Art Blakey's Version Of 'Three Blind Mice'" by Billy Collins. Carolyn--"The Tyger" by William Blake. You can read it in Poems and Prophecies [821 BLA]. Lois--"I Must Go Down to the Sea Again" by John Masefield. Robert Frost is a winner since two staff members picked these poems that can be found in Collected Poems [811 FRO]: Carl--"The Road Not Taken." Jane--"Birches." Remembering what has changed since last they came. This day in 1933 was a Sunday. In the evening, President Franklin Delano Roosevelt made the first of what was to become known as his radio "Fireside Chats" to the public. Heaps of mail and telegrams and numerous telephone calls brought evidence to the White House today of the support President Roosevelt is receiving from the public in the banking emergency. From every section of the country came suggestions for restoring confidence. Pledges of support began last week when the holiday was first proclaimed and reached a peak last night after Mr. Roosevelt had made an appeal for confidence and courage. A few minutes after the president concluded the White House switchboard was deluged with telephone calls from all sections, each caller praising Mr. Roosevelt's outline of the problem. So great was the volume of calls it was impossible for the switchboard to handle them all. Through the wonders of the internet, you can listen to Roosevelt's speeches. Click here for his historic first chat. Or, if you prefer, you can read it here. The People and the President: America's Conversation with FDR by Lawrence W. Levine and Cornelia R. Levine [973.917 PEO] covers the history of Roosevelt's fireside chats, and the written responses he received from the American public. It is 9:30 pm, Central Standard Time and we have just had the great pleasure of listening to your talk over the air. Its effect on our little group was just short of being miraculous. Our group was a son & wife entertaining father and mother, who are of foreign descent with little education, not accustomed to listening to radio talks and all Staunch, hard shelled Republicans. No sooner had your voice died on the air when Mother, 70 years of age, jumped from her chair saying, "Isn't he a fine man" and father with tears in his eyes said "I feel 100% better already." He had been worrying about his small savings of a lifetime. This, I am certain is the effect your talk must have had on all who heard you tonight. Couched in such simple language that all could understand, it could only serve to instill the deepest affection for and confidence in you and your undertakings. Clarkson, Kelly. Breakaway. [CD ROCK CLA] Her new CD was just released so look for it to come! I hope your favorite remains after last night's results are announced tonight! Today I have an appointment to have an old filling replaced. Dental work is definitely down at the bottom of my list of fun activities! One-fourth of U.S. adults aged 65 years and older have lost all of their teeth. You can find more information on this page from the Center for Disease Control. We have the topic in our YA section, too--Taking Care of Your Smile: A Teen's Guide to Dental Care by Autumn Libal [YA 617.601 LIB]. Have a smile filled day and wish me luck this afternoon! has gotten you or your family out of a tough financial crunch, helping you save in unexpected ways, tell us about it in an essay of 700 words or less. If we have helped you out of a money crunch, please let Woman's Day know! If we haven't, then perhaps you don't know about the wealth of materials that we have in our collection! There are books on finding employment such as: Get Hired Fast! : Tap the Hidden Job Market in 15 Days by Brian Graham [650.14 GRA], or Career Comeback: 8 Steps to Getting Back on Your Feet When You're Fired, Laid Off, or Your business Venture Has Failed--And Finding More Job Satisfaction Than Ever by Bradley G. Richardson [650.14 RIC]. Regular car maintenance may help you extend the life of your car--and avoid monthly new car payments. Look for this title on our shelves: The Lady Mechanic's Total Car Care for the Clueless by Ren Volpe [629.28 VOL]. And you know gas prices are going to inch up once the summer comes along, so this title may be of help: Beat High Gas Prices Now! : The Fastest, Easiest Ways to Save $20-$50 Every Month on Gasoline by Diane MacEachern [629.253 MAC]. The Carbon Buster's Home Energy Handbook: Slowing Climate Change and Saving Money by Godo Stoyke [644 STO] may help you to cut energy costs in your home. We have money saving ideas galore--come check them out! Last week I saw a courageous robin in the area around the base of a Japanese maple. There was no snow at the base, only a muddy ring. That little robin pecked and pecked and flung mud everywhere. I knew then that spring is coming! 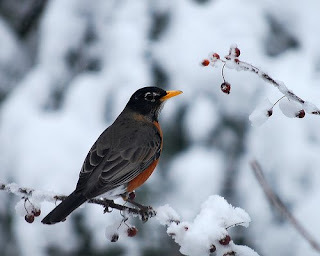 Sadly, we had a foot or more of snow on Monday, and I shudder to think about that little robin and his quest for food. You've got to love those robins! Yesterday I touched on caloric intake, memory, and the brain. Today I'd like to look at more about the brain. For example, we've all heard the terms right-brained and left-brained. Another term for it is "hemisphere specialization." What exactly does that mean? In practical terms, such as getting tasks completed, it can mean quite a lot! Here's a list, an inventory, of "the different ways the right brain and left brain process information." More information can be found here. Dr. Eric Braverman, a leading figure in the practice of brain-body health care, reveals the dramatic impact that proper brain nourishment can have on the quality of our lives. Each of us falls into one neurotransmitter category, and Dr. Braverman offers a simple test for finding out which one and offers practical programs. John Ratey, bestselling author and clinical professor of psychiatry at Harvard Medical School, here lucidly explains the human brain’s workings, and paves the way for a better understanding of how the brain affects who we are. Ratey provides insight into the basic structure and chemistry of the brain, and demonstrates how its systems shape our perceptions, emotions, and behavior. By giving us a greater understanding of how the brain responds to the guidance of its user, he provides us with knowledge that can enable us to improve our lives. 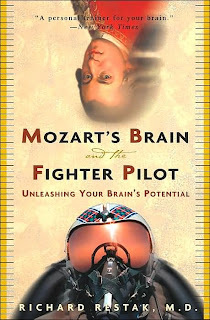 In Mozart's Brain and the Fighter Pilot, eminent neuropsychiatrist and bestselling author Richard Restak, M.D., combines the latest research in neurology and psychology to show us how to get our brain up to speed for managing every aspect of our busy lives. studies have shown that eating less may improve your memory. An article in Scientific American explains how fewer calories are good for both heart health and memory. Speaking of memory, a new title, Where Did I Leave My Glasses? : The What, When, and Why of Normal Memory Loss by Martha Weinman Lear [155.67 LEA] explains that some memory loss is normal as you age. I suppose I can take some comfort from that. I'll accept a small amount of memory loss and not worry about restricting my caloric intake! If you don't want the diet part of improving your memory, there are exercises you can try instead. Keep Your Brain Alive: 83 Neurobic Exercises to Help Prevent Memory Loss and Increase Mental Fitness by Lawrence C. Katz [153 KAT] sounds intriguing, doesn't it? As long as it doesn't involve crunches and push-ups, I'm ready! You can even consult the "World Memory Champion," Dominic O'Brien, for hints. His Quantum Memory Power: Learn to Improve Your Memory With the World Memory Champion is available in audio [AB/CD 153.14 OBR]. If you want to look at your brain and memory from the aspect of health, we have The Memory Cure: How to Protect Your Brain Against Memory Loss and Alzheimer's Disease by Majid Fotuhi [613.831 FOT]. I have my glasses, now where are my keys? 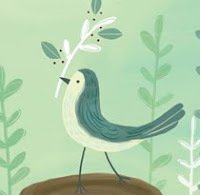 No, it wasn't the foot and a half of snow we got yesterday--I'm talking about the sounds of birds singing when I woke up today. To my mind it is a glorious sign that spring WILL arrive! Knowing that spring is nearly here and that birds are starting their northern migration, it's time to start thinking about building new birdhouses, or cleaning out old ones. 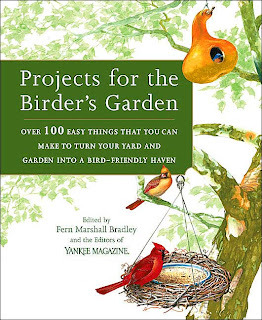 We have a relatively new book in our collection Projects for the Birder's Garden: Over 100 Easy Things That You Can Make to Turn Your Yard and Garden into a Bird-Friendly Haven [639.978 PRO] to get you thinking more about providing for your little feathered friends. And here's something else you can do to prepare for nesting time--start collecting your clothes dryer lint. Birds use bits of hair, string, and yes, dryer lint as nesting materials. I think if I were a baby bird I'd prefer a nice soft lint-lined nest! If you have a younger child at home, the two of you may enjoy reading a simple book about nests such as How and Why? Birds Build Nests by Elaine Pascoe [J 598.1 PAS]. An interesting website with great pictures and videos of birds and their nests can be found here. Titled "Look at Them Melons"
Okay, now that I've got your attention, go to the Quilters of South Carolina site for an eyeful of fun and supporting-a-worthy-cause undergarments! 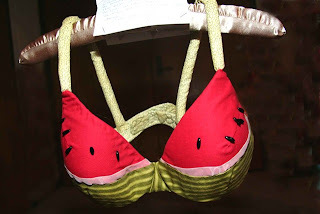 Yes, bras, or, as my mother used to refer to them, brassieres, to be auctioned off for Breast Cancer Awareness. I've already mentioned our one and only book on the subject of bras, Uplift: The Bra in America by Jane Farrell-Beck [391.4 FAR], back in July of last year when I had another short post on bras. For those who might accuse me of sexist posting, let me say that I haven't yet come across an adult book on men's undergarments. If you hear of one, let me know. I suppose I couldn't mention underwear literature without also mentioning Dav Pilkey's "Captain Underpants" books [J PIL]. With titles like Captain Underpants and the Attack of the Talking Toilets: Another Epic Novel, is it any wonder that the books are a big hit with second grade boys!